Before a canvas sneaker stepped onto a basketball court and before the Chuck Taylor All Star became a globally recognized symbol of self-expression, Marquis Converse founded the Converse Rubber Shoe Company in 1908. Ten rubber galoshes, Converse’s first products, were produced on April 30, 1909. In the beginning, the company also created triple tread tires, leather duck hunting boots and hockey pucks. During the World War II, Converse, like many American companies, shifted production efforts to supporting the troops. Its rubber origins contributed to the manufacturing of rubber boots, canvas training boots, weatherized gear and reversible camouflage ponchos. 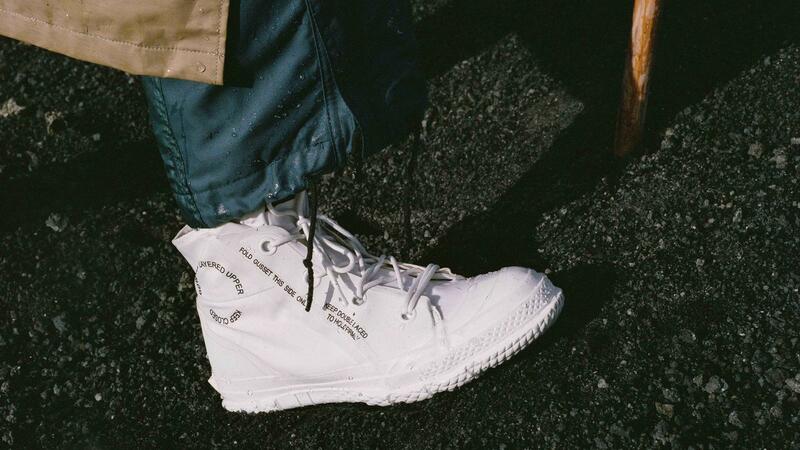 The utility of these heritage items shaped the new Converse Mountain Club capsule. Specifically, Converse was inspired by the Extreme Cold Weather Boot, a rubber military boot developed in the 1950s and once produced by Converse. Using this utility design lens, the new collection reinterprets three classic Converse styles — the Chuck Taylor All Star, One Star and Fastbreak — adding GORE-TEX® technology to make the shoes waterproof. The result: The Mountain Club line is at once stylish and functional. Converse Mountain Club is available from Converse and at select retailers November 8.